and Tanya Milligan. Bo is the veteran on Zion's elite high angle search and rescue team and knows the park as well as anyone. He was canyoneering in the park long before the term was used. 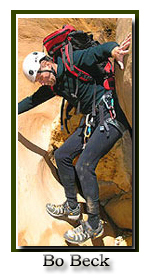 He still calls it "hiking with a rope" rather than canyoneering. Bo has served on the SAR team since 1996 and when he has time he is a lead instructor for Paragaon Climbing School. For six years Bo and I wrote monthly hiking articles for local magazines including Today in Dixie and St. George Today and spent every weekend, almost without fail, hiking, canyoneering or climbing together in Zion and the nearby areas that are covered on this site. We have just finished our first hiking book which should be on the shelves by Summer of 2011. Zion Peak Bagging- If you like getting to the top of things, then peak bagging might be your bag. Bo and I team up with Courtney and explore some of Zion's recently unpublished peaks. If you're thinking of joining today's world of canyoneering, be ready to lug a wetsuit up steep mountains, swim in dirty-ice cold water, climb up and down boulders, scale slick rocks and learn the technical skills and rope work required for rappelling and getting yourself through a canyon. Kolob Hiking - There are two sections of the park called Kolob, one by Cedar City referred to as Kolob Fingers or Kolob Canyons, and another near the small town of Virgin called the Kolob Terrace. Backpacking in Zion National Park - Backpacking can be found in all three sections of the park. The most popular are Zion's East and West Rims. Most Popular Trails - See our vacation planning section for suggested classic hiking trails. For the more adventurous take a look a Bo and Tanya's favorite trails in Zion. We also offer a chart of routes and trails just in Zion Canyon or another of those outside of Zion Canyon. Suggested Hiking Gear: A sturdy pair of shoes are recommend for many of the trails in Zion National Park. Many quality shoes will help grip the rocks and prevent injury. Routes in and on the edge of Zion, listed in order of difficulty. is far more difficult than a moderate or strenuous trail. Do not attempt routes beyond your skills. Do not wear inappropriate foot wear on rock! Remember! YOUR safety is always YOUR responsibility! 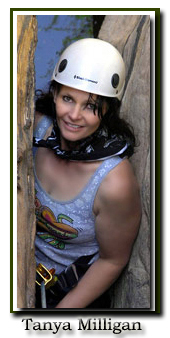 For more hiking information - To ask questions of Bo Beck and Tanya Milligan, as well as other's like Tom Jones, Joe Braun and Ram who are all authors who have spent a great deal of time hiking, climbing and canyoneering in Zion, join either or both of the following online outdoor chat groups. Bo and Tanya are both on Facebook too. Feel free to add us. Zion is one of the most diverse hiking meccas on the planet. Millions flock to the gates to enjoy slot canyons, daring trails and backpack the rims. Explore Bo's and Tanya's list of vantage points and vistas. Low and high deserts, waterfalls, high cliffs, sandstone wilderness, the Virgin River's lush valley and Zion's water filled slot canyons. The east side of Zion National Park is slickrock country. Slickrock is red sandstone that is lacking large concentrations of iron oxide. Thus these are, the more easily eroded rock forms, buttes and domes. The rock does not appear slick. In fact, it is rough and has a loose layer of sand on the surface. The rock formations on the east side of Zion are spectacular, but most of the well known front country trails are located in Zion Canyon. Kolob - There are two sections of the park called Kolob, one by Cedar City and another near the small town of Virgin. The Kolob areas are more primitive sections of Zion National Park and few visitors venture to their gates compared to those that visit the main section of the park. Canyoneering - From the famous Zion Narrows to technical slot canyons, this guide will take you to the depths of the park. The popular Zion Narrows is the most famous and exciting hike in the National Park system and one of the best known slot canyons in the world. While in Zion National Park at least walk out to the end of the Riverside Walk and get a glimpse of what everyone is excited about. Remember that Zion is canyon country. Rock falls, somewhere in Zion happen constantly and consistently. There are sheer cliffs, loose rocks and slippery sandstone. Think of standing on sandstone like standing on a layer of tiny round marbles. Be careful and be safe at all times.